Horses have been a part of my life since I can remember. My parents bought two Morgan horses when I was three. I was typically found eating their hay and grain and laying on them. My mom knew something that would last a lifetime, had begun. From ponies to larger horses, I didn’t care, as long as I could ride. As my experience grew with horses I found myself in 4-H at the age of 9. A hunter/jumper club had been started by two instructors, one was a Grand Prix jumping instructor from NY . He became my teacher for over five years. He helped me understand the basics of show jumping and lead me to many state championships. At the same time I was showing the Morgan in jumping, I also had a TB that I took through Level III English and Western Horsemanship in 4-H. We had three State Reserve Championships, which we were very proud of. Days would go by and never once did I miss a chance to be out with the horses. Even when it came to family vacations, including one to Hawaii! At the airport, ready to board the plane I was begging to stay and take care of the horses. When I was 10, my parents met Pat Parelli’s business manager, Vincent. He was playing with some horses at liberty and they were intrigued. They asked him to come and teach them, which led them to sponsoring Pat in Helena Montana for multiple clinics over the next five years. At the time I was less than impressed, after all, I was showing horses not playing with them. However, my jumping horse was starting to become harder and harder to ride, the snaffle was no longer working for him. So the next step was, a bigger bit! My parents would not support this idea, so I was given the halter and carrot stick along with the videos to study. In less than 6 months the Morgan had transformed, or rather I had! I could now jump in only the halter, play on the 45′ line and we were winning our classes again! It was the start of something that I am still very strongly connected to today. Pat Parelli came to Helena to offer a clinic. He was our guest and I remember sitting down with him one night as he asked me what I wanted to do when I grew up? I was 17 and knew it had to be something with horses. I just wasn’t sure what. He told me about his ranch in Colorado that was opening the next summer for students to come and learn. He also told me about the instructor opportunities. I was interested but really just wanted to play with horses. My parents signed me up for the first courses in 1996 that were offered at the Parelli ISC in Pagosa Springs,CO. It was for 4 months. Chez was just 4 and I didn’t even have a year of riding with her yet. We were asked to submit a video showing Level 1. Linda later told me I could have passed most of Level 3! Remember the ‘old’ level 3 that is! What an experience, I was the youngest person there by about 10 yrs! With my two mares supporting me I had many lessons to learn. Pat helped me through some important areas. I will never forget my two week lesson on the Clover Leaf pattern! Or learning how to work with cattle. I found that Liberty was a strong point for me. 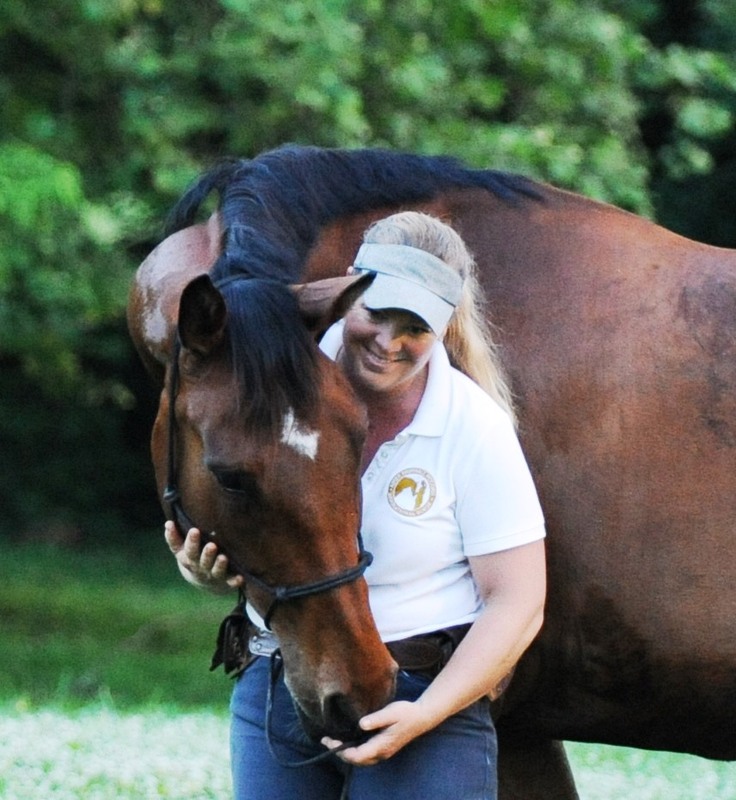 It has proven to be one of the most important areas that horse and human can share. I left there in the fall. To my surprise I was awarded my Student Instructorship. By Jan 1997 I had my Level 3 and was an official Instructor, the youngest at that time. With Level 4 as my new focus as well as teaching and colt starting I kept very busy. Teaching is a wonderful way to confirm what you know. It taught me so much about living what I was saying. I spent the next four years building my horsemanship skills and taking in some problem horses. Teaching had taken off and I was starting to travel out of state to teach. 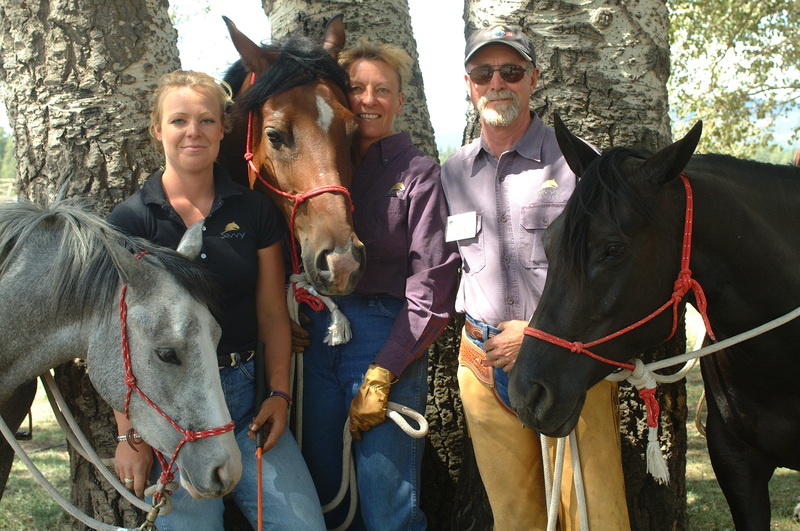 In 2002 I returned to Colorado for another horsemanship course. Little did I know that I was being assessed for Level 4, the whole time! There was only a small list of tasks one should be able to complete if Level 4 was to be achieved. Some were rear, piaffe, flying changes-collected, advandced liberty. There was quite the list on the old Level 4! I knew there was more to it then that, Pat had to “see” this Level 4 Savvy in everything you did! Oh wow, how was I going to do this?! At the 2002 Savvy Conference after a demo I performed he awarded me with my spurs. What a shock to me! Chez had been a star inspite of my nerves! I am sure that she knew, she didn’t miss anything the whole demo. So we became one of less then 10 worldwide Level 4 graduates. I happen to be the youngest, what an accomplishment! In 2002 Pat asked me to come on tour with him for 5 months. Honza Blaha and Ingela Sainsbury (now Larrson) were also with me. That was the Secrets to Success 2003/2004 tour across the US. What an amazing adventure! Our horses were just awesome, I still thank them for their support. The next couple of years consisted of teaching at the ISC Florida-Colorado and assisting Pat in the University course. Along with all my classes that I teach all over the US, I was very busy. One of my favorite places turns out to be outside of Milan, Italy. I met Luca Moneta at the ISC FL, and we hit it off. He asked me to come to Italy and help him with some difficult jumping horses. I had the best time. Helping people find their dreams is one of my favorite things. It has lead me to really reach outside the box. The horses continue to be my number 1 teacher. I strive to learn as much as I can from them and pass this onto students. In 2004/2005 I started exploring some of the big questions that I had from my years of teaching. I soon found that the horses were connected to some very interesting things! Our intention and how we use our Bubble! This led me to develop over the next 5 years a way of communicating that has created Inspirational Horse! At the end of 2009, I decided to not renew my license with Parelli. What a wonderful journey it has been so far, I truly appreciate and respect all that Pat has done. Thank you both Linda and Pat for everything. The horse world will never be the same! I have witnessed how sensitive horses are, especially to the unseen. Making this a personal mission, I have come to discover some amazing things! Horses can help us to connect to a side of ourselves that has been lost. In my Experiences, I dive into this further, offering ideas that will blow your mind! My focus today as it has always been is high level horsemanship. I love Classical Dressage and continue to study what the old masters taught and beyond. We all can see what is available today, but where does this all go? What is next on our journey with the horse? What amazing things are in store for us! With eleven horses I have learned that each breed brings something special to the table. My Quarter horse has such physical strength while my Lusitano has such agility. The warmbloods show such power! The Arab offers an amazing mental connection and my Quarter pony keeps me light hearted. Just love them all! I continue to see students achieving truly amazing results. Teaching has become a passion, something I truly enjoy. This passion has been with me from the start, and I love to pass this on to students. As for me full speed ahead! Note: I consider myself to be so very fortunate that I had parents that fully supported my love for horses. My mom passed away in 2017, I miss her so much. My dad and I still enjoy horses together. This photo was at the International Parelli Center in 2000. "Softness is a choice not an action. To become soft, look to the inside. What is the origin?" Horses are incredible animals with so much to share with us. 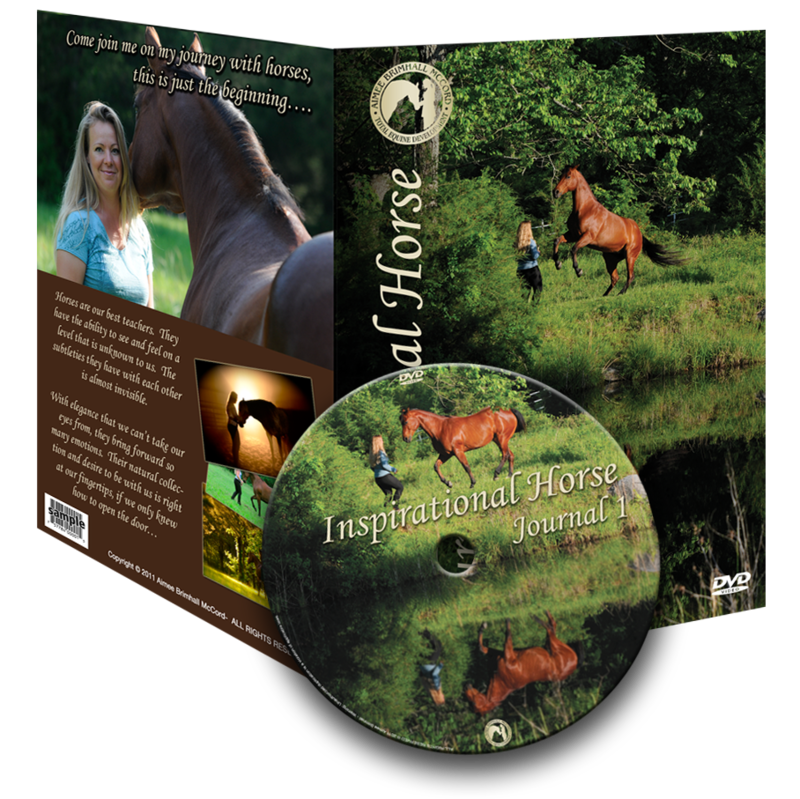 Journal 1 takes you inside Aimee’s world with her personal horses. Watch as she shares this special relationship with you. Come and learn more about what is possible between horse and human! 55 minutes of Inspiration from 6 different horses playing with Aimee. Limited production. We won't overload your inbox... Inspirational Horse newsletters are sent to subscribers quarterly. Experiences fill up very quickly and subscribing to our newsletter is one of the best ways to receive immediate notice of new event dates added to the schedule.